Olentangy Liberty boys soccer coach Marc D’Auteuil was hoping that his team wouldn’t notice when the United Soccer Coaches’ poll was released Tuesday afternoon. He was afraid his group would get too big of a head. Already the top-ranked team in Ohio, the Patriots came in at No. 2 in the national poll. “That stuff is irrelevant … it’s good to get recognized, but what does it actually mean in the grand scheme of things – really nothing. It just puts a bigger target on us,” D’Auteuil said. But, as it turned out, the players’ heads were just fine. Liberty scored two goals in the first half and cruised to a 4-0 victory at rival Olentangy Orange to open OCC-Buckeye play Tuesday night in Lewis Center. Liberty is home against Westerville South (Sept. 19) and Dublin Jerome (Sept. 21) and at Cleveland St. Ignatius next week – three teams that are combined 14-2-3 this season. Jared Whitfield broke the scoreless tie with 24:47 left in the first half. Jagger Brooker added the second goal, which he punched in off the right post with 4:53 left in the half to give Liberty a 2-0 lead. Whitfield compared the early season success to last season, which ended in a district semifinal loss to New Albany. Nathan Rothert and Ash Rajmahon each scored second half goals to round out the scoring for the Patriots (6-0). D’Auteuil hasn’t had much to complain about this season. He said his goalie let in a soft goal against Mason Friday afternoon – the first goal given up by Liberty this season. It was the second straight defeat for the Pioneers (4-4). 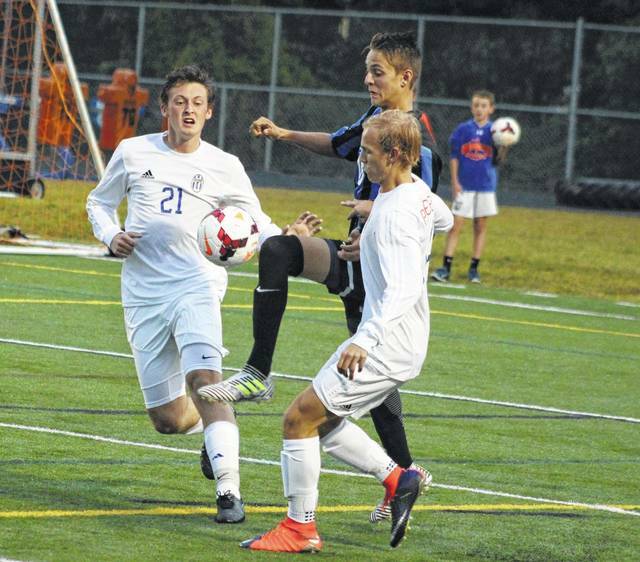 First year coach Jason Bayer was hoping for a stronger performance given the rivalry, which Orange won 1-0 last season in Powell to snap a four-game losing streak. “It was very disappointing from the standpoint of … it’s another Olentangy school and it doesn’t really seem like we came to play,” he said. Orange is right back at it Thursday when it visits Thomas Worthington in non-league action at 7:15 p.m.
Olentangy Liberty’s Nate Hoang, middle, battles for possession with Olentangy Orange’s Nathan Taylor (21) and Keegan Feeman during the first half of Tuesday’s league showdown in Lewis Center.